“I invite all Christians, everywhere, at this very moment, to a renewed personal encounter with Jesus Christ , or at least an openness to letting him encounter them; I ask all of you to do this unfailingly each day. No one should think that this invitation is not meant for him or her, since "no one is excluded from the joy brought by the Lord". Scroll down to watch the videos, or click here. Lord, I trust that you are present and very much want to instruct me in your teachings. In the same way that you demonstrate your love for me by spending this time with me, I want to express my love for you by dedicating this time to you with a spirit of faith, confidence and attention. Here I am, Lord, to listen to you and respond with love. Watch the videos below to know about this week's topic. Click on the section header below to reflect upon the topic and take action. Am I aware that the gifts presented are our gifts; that the bread and wine offered symbolise our entire lives and sacrifices; that I am present in the offertory? All that we do - in the liturgy and in our lives in the world - is meant to be in the service of consecrating this world to God. How can I more consciously unite my life to Christ so that my daily works may take on more power, meaning and effectiveness for God's kingdom? "Lord God of all creation, for through your goodness we have received the bread and wine we offer you". Even these simple gifts of bread and wine are first of all God's gift to us. By ourselves, we have nothing at all to offer! How can I be a better steward of God's abundant gifts to me? What can I offer back to build God's kingdom? Our declaration "It is right and just" reminds us that it is not only a good thing to give thanks, but it is our duty and responsibility as his creatures to do so. In what ways do I understand that giving thanks to God is a privilege and a responsibility? "Woe is me! I am lost, for I am a man of unclean lips and I live among a people of unclean lips, and my eyes have seen the King, Yahweh Sabaoth." (Isa 6:5). Isaiah"s experience of God's holiness gave him a humble sense of his own inadequacy and changed the direction of his life. How has my experience of God's awesome majesty and transcendent holiness ("Holy Holy, Holy, Lord God of hosts") at every Mass leads me to a similar change? I shall come to Mass with a special intention for myself or for others, and at the offertory, I shall offer it up with the gifts of bread and wine. Click the section headers below to read more on this week's topic. 1. What is the Preparation of the Gifts and what should we do during this part of the liturgy? The Preparation of Gifts marks the beginning of the second major part of the Mass, the Liturgy of the Eucharist. This preparation also has been traditionally called the offertory, since the priest prepares the gifts to be offered. This essential shift toward a focus on the sacrificial element of the Mass is embodied by the priest's own position in the sanctuary. Throughout the entirety of the Liturgy of the Eucharist (from the Preparation to Holy Communion), he stands centrally at the altar, functioning as priest, as one who offers sacrifice in the person of Christ (Latin: persona Christi) and as the father of a family at the family meal. During the Preparation of Gifts several actions occur simultaneously: the preparation of the altar which is the center of the whole Liturgy of the Eucharist, the collection, the presentation of the gifts and the offertory hymn. We present the gifts of bread and wine to the priest, symbolizing an offering of creation and ourselves back to the Father. Though the gifts do not count for much on their own, what gives them immense value is that we unite them with Christ's perfect sacrifice. It is as if we bring our lives and all our sacrifices to the hands of Jesus Himself (represented by the priest). The priest then brings our gifts to the altar, which is the place where Christ's sacrifice is made present, in order to express our union with Christ's offering to the Father. The temptation is to treat this part of the Mass as taking a break before the Liturgy of the Eucharist. Rather we should use this moment to recollect ourselves and prepare interiorly for the sacrifice about to occur at the altar. Our preparation should include a refocusing on the actions and prayers of the priest as well as an interior union with the offering itself, whereby we offer our prayers and ourselves in the same way that we offer these gifts of bread and wine, hoping that just as they are changed into the Body and Blood of Christ, so may we be transformed by His grace. 2. During the preparation of the altar, what are the items placed on the altar and what are they used for? 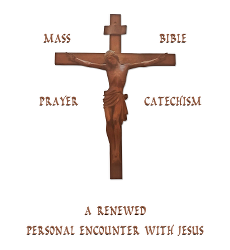 Roman Missal - the book with all of the prayers used during the Mass. The sacred vessels are to be made precious metal in order that they may befit the dignity of that which they contain. All the cloths used at the altar (including the altar cloth) are considered sacred items because they may come in contact with the body and blood of Christ. We devote great care to the creation and upkeep of these altar's accoutrements as they are to serve as thrones of Christ the King, who is really present in the Eucharist. 3. Why do we have a collection? What is its significance and what is the money used for? Since the earliest days of the Church, Christians have used this part of the Mass to "take up a collection" or "pass the basket". In the first centuries, Christians would bring foodstuffs like fresh fruits, wine, vegetables, cheese, livestock and place them by the altar, leaving them at the disposal of the priest. During the collection, we are asked to present a monetary contribution for the support of the church, both local and universal. These collections help the parish in its day-to-day operations, funding of charitable activities as well as to support the ministries of the parish, the archdiocese, and the church worldwide. The collection usually is brought to the sanctuary by members of the congregation in a procession. This expresses outwardly the gift of self on the part of the individual, but also the very vital role of the community in the liturgical worship. Accompanying all of this is a hymn or music, which serves the purpose of fostering that sense of interior gift of self to the Lord. Our labour throughout the week are presented at Mass, since our monetary offering, which embodies hours of our lives and hard work, is placed before God in the Offertory. Even though man has to work and toil as a result of the Fall, earning his bread by the sweat of his brow, God now takes that effort and transforms it. Whenever we are tired with work and toil, we can remember the Mass and unite it to Christ's offering. Putting our contribution in the collection is a moment of thanksgiving to God who allows us, at whatever hour, to work in His vineyard. 4. Must our gifts always be bread and wine? Bread and wine are the essential signs of the eucharistic sacrifice and cannot be substituted with other elements. The bread and wine are the very elements which Christ took in his own hands. "The essential signs of the Eucharistic sacrament are wheat bread and grape wine, on which the blessing of the Holy Spirit is invoked and the priest pronounces the words of consecration spoken by Jesus during the Last Supper: 'This is my body which will be given up for you.... This is the cup of my blood....'" (CCC 1412). "By the consecration the transubstantiation of the bread and wine into the Body and Blood of Christ is brought about. Under the consecrated species of bread and wine Christ himself, living and glorious, is present in a true, real, and substantial manner: his Body and his Blood, with his soul and his divinity" (CCC 1413). At the Last Supper, Jesus transformed the unleavened bread of the Passover meal into his body. Bread symbolizes life. Similarly, the eucharistic bread - the body of Christ - is the food necessary for spiritual survival. Jesus is the Bread of Life. Jesus also transformed wine into his blood. Wine, a drink that gladdens people's hearts (Ps 104:13-15), symbolizes both joy and life itself. The eucharist gives us a foretaste of the joy of a superabundant life the Lord has won for us. When we drink the cup of salvation, we participate in the great saving deeds of Jesus. 5. What is symbolic significance of the gifts of bread and wine as an expression of our own participation in the Mass? In the bible, bread was not merely a side dish as it is in most societies today. Bread was the most basic type of food, seen as necessary to sustain life. A family could not survive without its daily bread. To part with one's bread would have been a personal sacrifice, expressing the individual's giving of himself to God. Similarly, wine was not just a side beverage, but a common part of the ancient Israelite meals. Like bread, wine was also offered up in Israel's sacrifices. With such a close connection between the sacrificial gifts and the individual giver, offering bread and wine symbolized the offering of one's self. At that time, the bread and wine were often personally supplied by members of the faithful. Although these gifts are now purchased by the church with our monetary offerings, they still represent our self-offering and participation in the Mass. Life is hard with various struggles and sufferings scattered throughout our joys and successes. Both the bread and wine symbolize this, since both the wheat and the grapes are crushed and then baked or fermented in order to make bread and wine. Therefore, in them and with them, we offer our own struggles and sufferings with our joys and successes to God. 6. What prayers does the priest say as he presents the bread and wine to God in preparation for the Eucharistic Prayer and consecration? After receiving the gifts of bread and wine from members of the community during the presentation of the gifts, the priest stands before the altar to prepare the offering before the Eucharistic Prayer. He begins by taking the paten with the bread on it and holds it slightly above the altar with both of his hands and prays in a low voice, "Blessed are you, Lord God of all creation, for through your goodness we have received the bread we offer you: fruit of the earth and work of human hands, it will become for us the bread of life." Then the priest elevates the chalice in both of his hands and pronounces a similar blessing: "Blessed are you, Lord God of all creation, for through your goodness we have received the wine we offer you: fruit of the vine and work of human hands, it will become our spiritual drink." When the priest pronounces these two blessings - the "blessing over bread" and "blessing over wine" - he is doing what Jesus did at the Last Supper. The Passover meal includes those two actions accompanied by familiar words: "Blessed are you, Lord our God, king of the universe, who creates the fruit of the earth .... Blessed are you, Lord our God, king of the universe, creator of the fruit of the vine." If no offertory hymn is sung, the priest may speak these words aloud in which case, we respond, "Blessed be God forever." Besides thanksgiving, these prayers also teach us an important lesson: God wants our collaboration in his work. He gives us natural gifts ("fruit of the earth"/ "fruit of the vine") but they require "work of human hands" in order to become offerings for God, who will then transform them into our "bread of life"/ "spiritual drink". 7. Why does the priest pour water into the wine? Before offering the wine, the priest pours wine and a little water into the chalice. As he pours the water into the wine, he quietly prays, "By the mystery of this water and wine may we come to share in the divinity of Christ who humbled himself to share in our humanity." Historically, that was the custom for most Mediterranean people living in the time of Jesus. They stored wine in a concentrated form and then diluted it at mealtime. Most of the ancient descriptions of the Passover meal described the mixing of water with wine. The Church, however, retained this gesture long after the customs of wine storage had changed. Besides providing a historical connection with the Passover meal, it is a symbol of the union of the human and divine natures in Jesus: like the water and wine, they were so close as to be inseparable. While the wine symbolizes Christ's divinity, the water symbolizes our humanity. The mingling of the water and wine points to the Incarnation: the mystery of God becoming man. It also points to our call to share in Christ's divine life. Some Church Fathers also see this mixture as a symbol of the communion of Christ with the Church - again so close as to be indistinguishable from one another. 8. Why does the priest wash his hands? What does he pray as he washes his hands? At this part of the Mass, the altar servers stand ready at the side of the altar, with a pitcher of water, a small basin (the lavabo), and a towel. The priest then washes his hands and quietly prays, "Wash me, O Lord, from my iniquity and cleanse me from my sin." The priest stands at the altar as the priests of the Jerusalem Temple stood at their altar of sacrifice, many centuries before. Like those priests of old and like God's people who long ago observed the Passover, he ritually washes his hands - a baptismal image, signifying his wish to be cleansed of his sins and worthily offer the sacrifice. Clean hands are associated with a pure heart. "Who shall ascend the hill of the LORD? And who shall stand in His holy place? He who has clean hands and a pure heart" (Ps 24:3-4). In this psalm, ritual hand-washing symbolizes the internal cleansing of heart required before a person could draw near to God's presence in the sanctuary. The priest's hand-washing at Mass indicates that he, like the priests of old, is about to stand in a most holy place. On the altar before which the priest stands, the gifts of bread and wine will soon be changed into Christ's very body and blood, and our Lord will soon dwell within us as we receive Him in holy communion. Jesus, the one true High Priest, will accomplish this through the priest's hands. His prayer is also a reference to King David's Psalm of repentance (Psalm 51) in which he repents from his sins of adultery and murder. It is a reminder to the priest of his own sinfulness and unworthiness to stand before the altar of the Lord and offer the sacrifice of the Mass. 9. How does the Preparation of the Gifts end? The Preparation of Gifts concludes with two prayers. First, the priest and we pray that the sacrifices that are being offered will be acceptable to God. 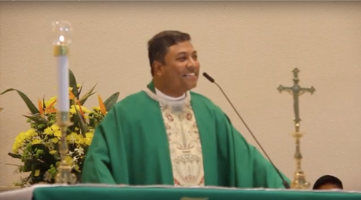 The priest, standing in the middle of the altar facing us, says, "Pray, brethren (brothers and sisters), that my sacrifice and yours may be acceptable to God, the almighty Father." We stand and respond, "May the Lord accept the sacrifice at your hands, for the praise and glory of his name, for our good and the good of all his holy church." The priest then prays over the offerings. Its purpose is to unite all of the above actions, prayers and gestures into a single prayer that offers these simple gifts of bread and wine to the Father. With our priest, we ask God to transform the gifts we place on the altar, and so transform us, and so transform the world. At the end of the prayer, we signify our agreement by responding "Amen." 10. Why do we sing "Holy, Holy, Holy"? The "Holy, Holy, Holy" is an acclamation of praise that we sing after the priest has prayed the Preface – a prayer of thanksgiving on our behalf. This hymn and prayer invokes the intercession of the angels and saints that they may aid us in entering this divine mystery, while also calling to mind the fact that what we do in the sacred liturgy is God's action, and the angels and saints are present with us as we unite our action in the earthly liturgy with the heavenly liturgy. It is only fitting, that we stand, to sing this acclamation with the heavenly powers, kneeling only when sung in its entirety. Like the Gloria, the Sanctus - as it is called by its Latin name - is a song that we learned from the angels. This acclamation is a song the angels sing forever in heaven as revealed in scriptures. In the Old Testament, Prophet Isaiah reports a vision of heaven: "Seraphim were stationed above; each of them had six wings: with two they veiled their faces, with two they veiled their feet, with two they hovered aloft. 'Holy, Holy, Holy is the Lord of hosts!' they cried one to the other. 'All the earth is full of his glory!'" (Is 6:2-3). In the New Testament, St. John repeats this detail as he describes his own mystical experience of heaven: "The four living creatures, each of them with six wings .. day and night they do not stop exclaiming: 'Holy, Holy, Holy is the Lord God almighty, who was, and who is and who is to come.'" (Rev 4:8). Holy means set apart, transcendent, heavenly as opposed to earthly; and God alone is holy by nature. This thrice-holy phrasing may be strange to our modern ears, but by calling God "holy" three times, it is a Hebrew expression of declaring God as the most holy of all things, the strongest form of the superlative in Hebrew. This acclamation also reminds us that God is the supreme power over heavenly and earthly forces, and that this power is about to change bread and wine into the Body and Blood of Christ. Christians have also interpreted this thrice-holy hymn as a confession of the triune God: the Blessed Trinity. 11. What is "Lord God of Hosts"? Lord God of Hosts (or Sabaoth in Hebrew) is a divine name of God used often in the Old Testament. One example is in 1 Sam 17:45: "Then David said to the Philistine, 'You come to me with a sword and with a spear and with a javelin; but I come to you in the name of the LORD of hosts, the God of the armies of Israel, whom you have defied.'" Another example is in Isa 9:6-7 : "For to us a child is born, to us a son is given; and the government will be upon his shoulder, and his name will be called 'Wonderful Counselor, Mighty God, Everlasting Father, Prince of Peace.' Of the increase of his government and of peace there will be no end, upon the throne of David, and over his kingdom, to establish it, and to uphold it with justice and with righteousness from this time forth and for evermore. The zeal of the LORD of hosts will do this." This name is used as a title of majesty and it refers to God's power over an army of angels, the invisible powers which are in force at God's command. It also emphasizes God's ultimate power over the whole universe and every living creature. All creatures and all of creation are subject to the power of God. No one stands before God, except by His power, mercy and grace. We can only approach Him out of His love for us, out of Christ's sacrifice for us and "out of the boldness" (Heb 4:16) and advocacy of the Spirit in us. 12. How should we understand these two phrases: "Hosanna" and "Blessed is he who comes in the name of the Lord."? "Holy, Holy, Holy Lord God of hosts. During Jesus’ entry into Jerusalem, riding on a donkey, the people chanted this phrase "Hosanna" and "Blessed is he who comes in the name of the Lord." Blessed is the kingdom of our father David that is to come! The LORD is God and has enlightened us. The word "Hosanna" is translated into English as "Save us, we pray" So in these verses we see a people who are rejoicing over someone whom God has sent. When they say "Hosanna", they are referring to the messiah who they believe is to come from God and grant them salvation. It is fitting that we repeat these words at this moment in the Mass. Just as the crowds in Jerusalem welcomed Jesus into the holy city with these words from Psalm 118, so do we welcome Our King into our church, who will become present in the Eucharist on the altar.